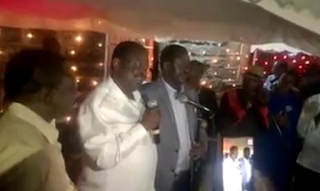 This past weekend, Musalia Mudavadi hooked up with Raila Odinga, Orengo and a few other ODM politician at a joint, and he made the mistake of addressing the crowd after more than a few rounds of beer. The former Presidential candidate was so drunk he could barely hold up his mic. Raila was also drunk but he didn't want to speak, he decided to hold his breath, and that was the best thing he could do at the time. In his drunk speech Mudavadi hinted at going back home to ODM, but maybe that was the beer talking, watch it below.